Also featured in Underground Construction and Pipeline News. Thousands if not millions of barrels of water are needed every day for shale oil and gas extraction. Securing and delivering such mass quantities of water to frack sites efficiently is always an ongoing challenge, and that challenge isn’t going away any time soon. The US Geological Survey has identified billions of barrels of recoverable oil in the Permian Basin, and the demand for water is perhaps higher than it’s ever been. Oil production continues to rise and drilling is expected to last for decades. To ensure an adequate supply, water typically has to be secured from a variety of sources and delivered by truck. Hundreds of trucks come in and out of the oil fields each day for this purpose. But one drilling and exploration company is working on a more permanent solution — one that would reduce their reliance on freshwater and provide a more reliable delivery system. According to news reports, Pioneer Natural Resources has partnered with the cities of Midland and Odessa, Texas, for the reuse of their treated waste water. In exchange, the company will provide $115 million in upgrades to Midland’s water treatment plant, which would otherwise be taxpayer funded, and a $117 million funding stream for Odessa. 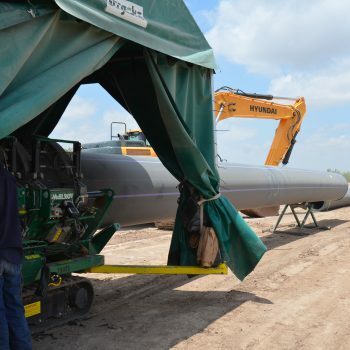 This has resulted in one of the biggest high-density polyethylene (HDPE) water pipelines that have ever been constructed in West Texas with sizes ranging from 24 inch to 36 inch. Each pipeline spread consists of about 150 employees. According to engineers, this will be a permanent infrastructure system about the size of the state of Delaware but with two to four times the demand of a small suburb. Many pipe materials — HDPE, carbon steel, concrete, fiberglass — were analyzed at the beginning of the project. Cost, availability, ease of installation, familiarity in the field and, most importantly, corrosion resistance were all considered. Corrosion is a big concern in the oil patch especially with the more brackish and high TDS (total dissolved solids) water. Midland’s water has a high scale index, so a pipe material that is resistant to scaling with excellent flow characteristics was needed. HDPE pipe came out ahead with good chemical resistance and leak-free joints that can be easily constructed in a relatively short period of time. It has a long lifespan of up to 100 years. Its flexibility meant that it could withstand surges, and since cathotic protection is not required for HDPE because it is noncorrosive, HDPE would also be cheaper to maintain. Procuring the pipe, finding a contractor experienced in large-diameter heat fusion and even the availability of enough large-diameter fusion machines to make their daily footage goals didn’t happen magically. A considerable amount of study went into researching pipe resin availability, pricing and delivery capabilities. A representative from the Plastics Pipe Institute visited pipe mills to make sure the pipe met specifications including those for roundness, wall thickness and material testing. 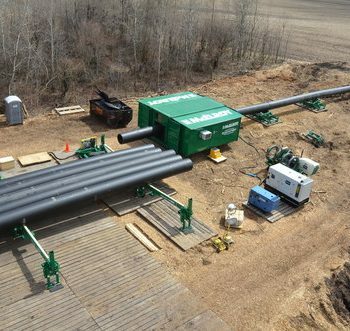 An order for 12 machines was placed and it was required that each machine be able to fuse at least 200-feet of HDPE pipe a day. Five companies were shortlisted to provide the pipe, eventually awarding the contract to WL Plastics, DuraLine and IPP/Georg Fisher. Gajeske, SECOR and ISCO were selected for supplying the HDPE fittings and accessories. Many large-diameter fusion machines were needed on site to keep the construction schedule on target. For the entire 600-mile project, approximately 63,360 fusions will be made. Machines as well as fusion operators were needed who could stand up to that kind of work load. Gajeske, a master distributor of McElroy equipment, provided the bulk of the fusion machines — all TracStar® 900s — with SECOR filling in the final slots. 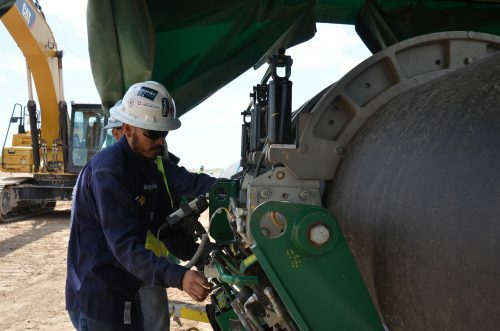 Gajeske was also selected to do the pipe fusion on two project phases — 24 miles of 30-inch DR 11 and 30 miles of 36-inch DR 11 — under general contractors Culberson Construction Inc. (CCI) and Boyd & Company. Gajeske completed their fusion work portion of the project in August 2017 as scheduled. The number of fusion technicians on site ranged from 12 to 15 with as many as 17 fusion machines available. Each operator averaged 7 to 8 fusions a day on the 36-inch pipe (400 feet per day) and 8 to 9 fusions a day on the 30-inch pipe (450 feet per day), exceeding the preset goals for the project. Gajeske’s 12-machine fleet averaged a daily production rate of 4,800 feet per day on the 36-inch pipe and 5,400 feet per day on the 30-inch pipe. Gajeske only brought in technicians that had at least two years’ experience and required them to recertify their Operator Qualification for large-diameter fusion through McElroy University. Their previous fusion history was vetted and technicians had to make test welds that passed side bend tests of the joint before they were allowed onsite. Chad Abatie, SW Regional Manager, Gajeske, said their technicians know how to service the McElroy machines and have had minimal down time. They go through a checklist each morning to ensure their machine is fully operational before fusing pipe. As of August 2017, Gajeske’s crews had fused about 80 miles of large-diameter pipe. Abatie said that they have the ability to produce quality welds in a very production-intense environment because they put the correct people in place with the proper training and experience. One technician was assigned to each machine and three people in quality control representing the sub-contractor, general contractor and project owner work together to visually inspect the welds and ensure that the technicians are fusing to standard. More than 30 people trained at McElroy University to be fusion inspectors. “It’s been very beneficial to have that much quality control. We’ve got to go through lease roads and cattle guards, it just takes a while to get around. Having that much coverage really helps,” Abatie said. Data logging of every joint was also required. 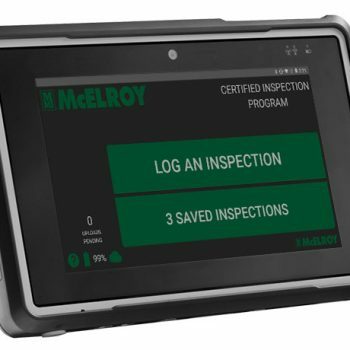 Technicians used the McElroy DataLogger® which provides a record of the heating and cooling times and other processes that were used to produce each pipe joint. At the end of the day, quality control uploads the reports to the Vault™, a secure online server where the data can be sorted and analyzed to ensure that all of the fusion processes complied with specifications which included ASTM F2620 and API 15LE. With the Vault, they know everything there is to know about each weld — pictures to show what the weld looked like and even its exact location after it is buried. The completed system will consist of roughly 80 miles of mainline pipe and 520 miles of lateral lines that will feed the frack ponds. Engineers wanted to avoid pulling the fused pipe strings because of their heaviness and potential stress on the pipe, so they opted to string it out, stick by stick. For exact placement, they staked off the GPS coordinates for the location of each 50-foot section of pipe. 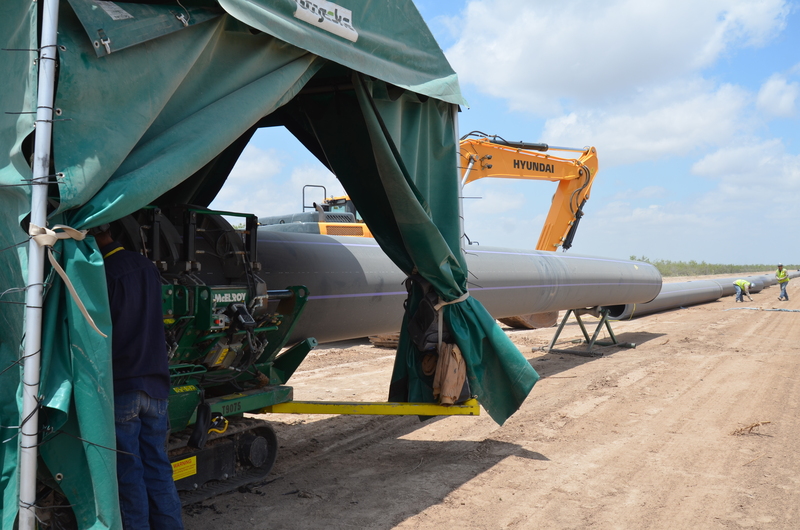 The McElroy TracStar machine worked well in this situation since it operates on a self-propelled, rugged track system that can travel from joint to joint along the pipeline. The machine is also self-contained, so there was no extra equipment to transport to each fusion location separately — it was all onboard. Once technicians fused up to the tie end location, they were right on the money without overlaps or gaps in piping. Engineers designed the pipeline taking into account elevation changes and pressure drops that occur with large flows which required frequent pump stations throughout the system. 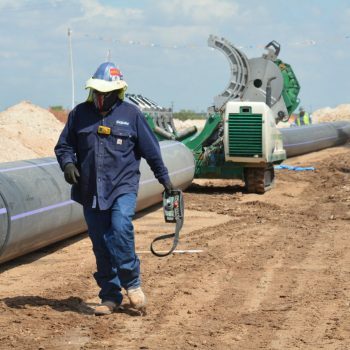 In following environmental guidelines, HDPE offered additional assurance because it is joined together through the science of heat fusion which creates leak-free joints, preventing any contaminants from seeping into the ground. It is also a strong and resilient pipe material, so for the most part, they didn’t have to worry about constructing thrust blocks to protect the joints. When it comes to fittings this large, the industry doesn’t offer one size that fits all. Pipe experts create individual and unique solutions appropriate for the job. 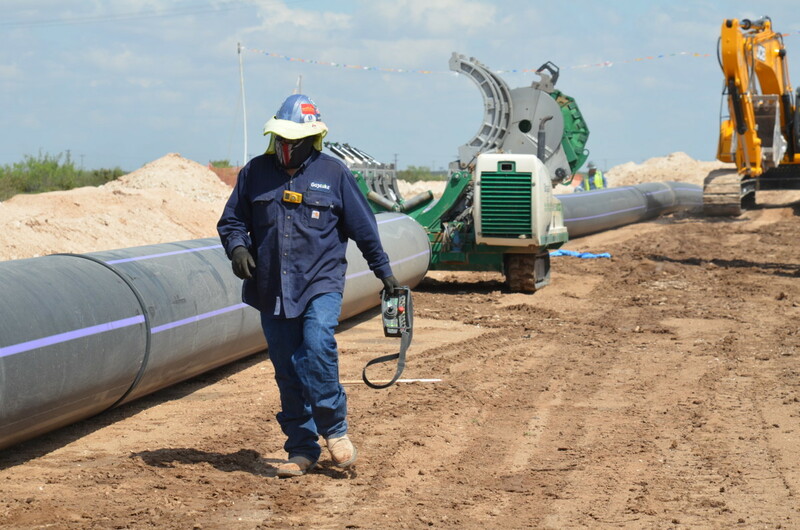 This project provided such an opportunity to engineer the tie end connections between two different pipe material types — from 36-inch HDPE to 30-inch carbon steel. Fluctuating temperatures causes HDPE to expand or contract. Though that is perfectly normal and doesn’t damage the pipe, it does create some challenges when connecting it to steel. SECOR helped design a prototype that was successfully tested extensively with zero-leak results. Experiments were conducted with flanged joints but they switched to a compression transition fitting where the carbon steel fits inside the HPDE. It is then compressed from the outside to provide a stronger joint. Hydro tests required days of torqueing. But with the compression transition fittings, they were able to fuse the HDPE then bolt on a steel flange which was much easier. City and energy leaders have stated publicly that the development of a permanent infrastructure system through a public-private partnership brings many benefits to the area: maximizes resources, optimizes recycling efforts, conserves freshwater, increases conservation efforts, updates city infrastructure, creates jobs and reduces water trucking on public roadways.